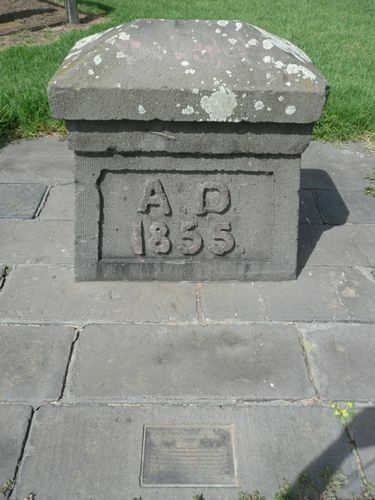 The Memorial Stone commemorates the commencement of the construction of the breakwater, and the Williamstown, Mount Alexander and Murray Valley railway line. The Melbourne Mount Alexander and Murray River Railway Company was formed in 1853 to provide a rail link to port facilities at Williamstown as well as the line north to Echuca, within seven years. The Government took over the faltering project in 1856. An extensive cutting through basalt was required from Newport to Point Gellibrand and arched bluestone road bridges were built over the cutting at Thompson and Cole Streets. A single temporary line led to the pier by 1857, accompanied by the first of three Pier stations. The Railway pier at Point Gellibrand, which was the terminus of the line, was completed in 1858. By the time of the official opening in 1859 two tracks led past the completed Williamstown Station through the railway workshops and on to the pier. This Historic Basalt Marker Formerly Stood Upon The Approaches To Breakwater Pier And Was Erected To Commemorate Inauguration Of The Construction Of The Breakwater And Of The Williamstown, Mount Alexander & Murray Valley Railway System By Private Enterpise.